The musical play Camelot opened on Broadway at the Majestic Theatre on December 3, 1960. The abbreviated Kennedy presidency would be referred to as "Camelot" after First Lady Jacqueline Kennedy revealed that the show was John Kennedy's favorite Broadway musical (Jay Lerner had been a classmate of Kennedy's at Harvard. The Kennedy Camelot myth disregards the fact that the show was about misguided love, treason, and adultery; as 1961 dawned with Kennedy's inauguration the future seemed to belong to a young President who would slay the dragons of Communism and bring forth an age of wonder and enlightenment. 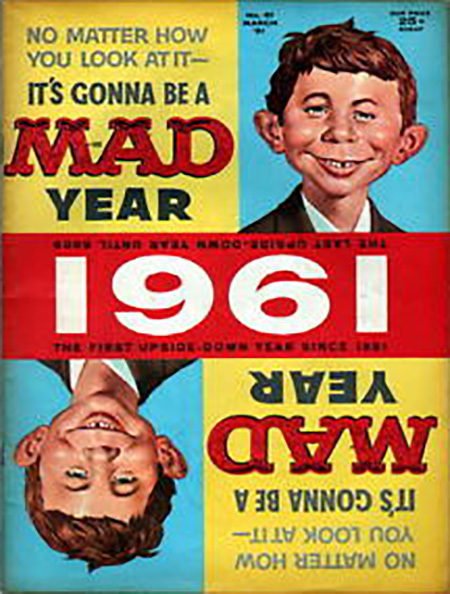 MAD magazine pointed out in the March issue that 1961 was, in fact, and upside-down year, the digits reading the same no matter how they were oriented. Outgoing President Eisenhower delivered his Farewell Address to the nation on January 17. The address was a "solemn moment in a decidedly unsolemn time" and was meant to serve as a warning to a nation "infatuated with youth and glamour". The speech is most famous for the former military leader's warning against the corrupting influence of the "military-industrial complex", describing it as "nothing more than a distorted use of the nation's resources." The counter-point to Eisenhower's speech came at the end of the week with Kennedy's inauguration, which kicked off with a pre-inauguration ball organized by Frank Sinatra and Peter Lawford. The new President's inaugural address was delivered with Kennedy bare-headed and wearing just a suit coat as protection against the weather (a powerful nor'easter had blown through Washington the day before, the Corp of Engineers added 1,700 Boy Scouts and flamethrowers to the task force employed to clear eight inches of snow from the parade route". The address was incredibly optimistic, with Kennedy calling on Americans to "ask not what your country can do for you, ask what you can do for your country." Despite his youth and optimism, Kennedy would prove to be a staunch and determined (if not immediately well guided) Cold Warrior. The previous administration had allocated $13.1 million for a CIA-backed plan to overthrow Fidel Castro's government in Cuba (one of Eisenhower's final acts was to break off diplomatic relations with the island nation on January 3). 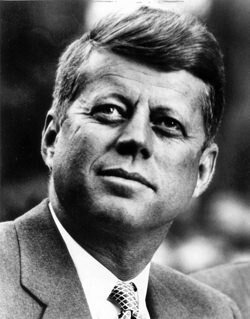 The decision to implement the plan was left to the incoming President, and Kennedy allowed himself to be sold on the plan. A brigade recruited from the Cuban exile community landed at the Bay of Pigs and were nearly immediately overwhelmed. Hoping to cover American involvement in the invasion, Kennedy withheld air support by the US Air Force, and the operation not only failed miserably but strengthened Castro's standing in the international community. 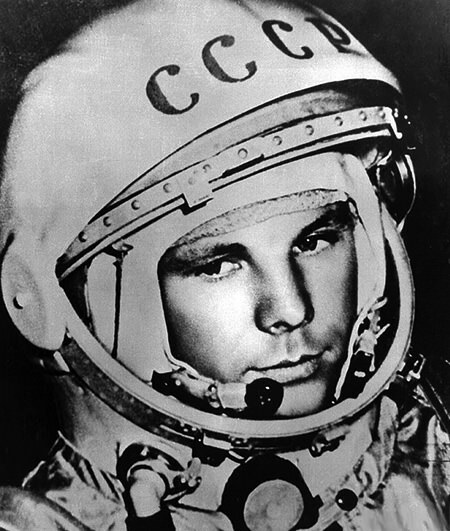 Although a decided embarrassment to the new administration, Kennedy chose not to deflect blame for the operation and assumed responsibility, stating: "There's an old saying that victory has a hundred fathers and defeat is an orphan ... Further statements, detailed discussions, are not to conceal responsibility because I'm the responsible officer of the Government ..."
Just before the Bay of Pigs, Cosmonaut Yuri Gagarin became the first human in space, orbiting the earth on April 12. While awaiting news of Alan Shepard's flight Mercury-Redstone Freedom 7, President Kennedy was briefed on rising tensions in Southeast Asia. On May 25, Kennedy announced the goal of "landing a man on the Moon and returning him safely to the Earth" before the decade ended, effectively launching the Apollo Program. The President met with Soviet Premier Nikita Khrushchev in Vienna, Austria, on June 4. The primary topic discussed was the Berlin Crisis along with conditions in Southeast Asia. The Bay of Pigs Crisis damaged the relationship between Kennedy and Khrushchev, and the President later related "He beat the hell out of me" in a subsequent interview. 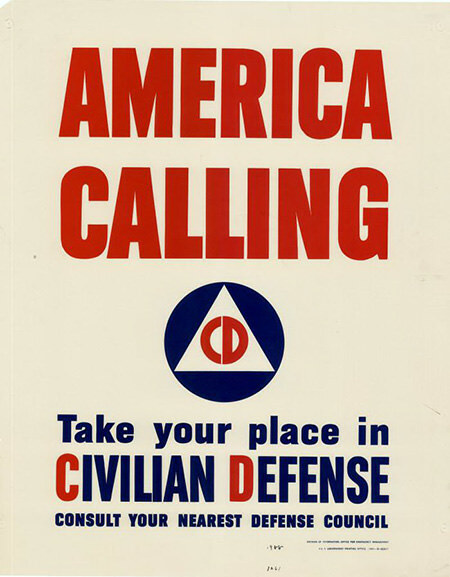 In a report to the nation on July 25, Kennedy announced his intention to expand US military power and called upon citizens to build and stock fallout shelters. A debate on Civil Defense would go on for months. FCC Chairman Newton N. Minow described commercial programming on television as a "vast wasteland". Although network radio continued to lose sponsor support to TV, programming continued to be comforting. The Bing Crosby - Rosemary Clooney Program featured taped conversations and recorded songs from the crooner and his dear friend and White Christmas (1954) co-star. Gunsmoke was becoming one of the most important programs on TV but had entered its last season as a radio program. Suspense and Yours Truly Johnny Dollar continued to produce fine shows from well-written scripts. 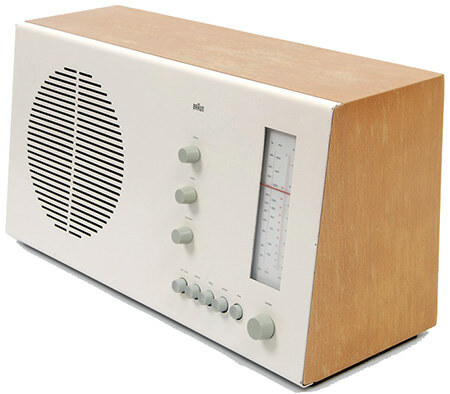 Radio became an important voice of the Cold War with demonstrations of CONELRAD and the Emergency Broadcasting System. As the year comes to a close, America officially enters the Vietnam War when American helicopters and 400 troops arrive in Saigon in an attempt to make good on President Kennedy's inaugural promise to "pay any price, bear any burden, meet any hardship, support any friend, oppose any foe, in order to assure the survival and success of liberty." Be the first to comment on "1961"